Below are a few details about Year 3 Home Learning. If you need any further help with what your child should be doing at home or how you can help, then please feel free to pop in and see us. Spellings are handed out on a Monday and the children should be rewriting the lists (using Look, Cover, Spell, Check) on Tuesday, Wednesday and Thursday. We test the children on their weekly spellings in a variety of ways, as well as continuing to practice the sounds/rules in our literacy learning during the week. The children have a home reading book from the library they choose independently and some children will also have a levelled reading book assigned by an adult. We encourage the children to read as often as possible (for 10-15 minutes) to any willing listener! Please record when your child reads in their Home School Reading Record – we also use this as a communication book between school and home. Please feel free to read and record any other books /magazines /comics /picture books etc. your child enjoys. The current national age-related expectation for children at the end of Year 3 is that they know all times tables and related facts for the two, five, ten, three, four and eight times tables. This should mean that they can recall them instantly and that they know the related division facts. We will teach these as part of our usual maths curriculum however in order to support your children to achieve this, we ask that they practise the table they are currently working towards daily for about 5 minutes. This has huge benefits in other areas of maths such as fractions, ratio, percentages and division (not to mention increased confidence). Children will be tested weekly in class and earn stickers as they progress. As there are already a variety of tasks set weekly, we do not normally give out any extra homework. However, if your child is keen, then they can log onto Education City (they have been provided with a Login) and undertake any of the Year 3 tasks. Occasionally, we may also set an extra homework linked to our topic. We would like to make Home Learning an ‘enjoyable’ experience for all, so please spend no longer than 30 minutes on any task (even if this means it isn’t finished.) If your child wishes to work for a longer time then great! 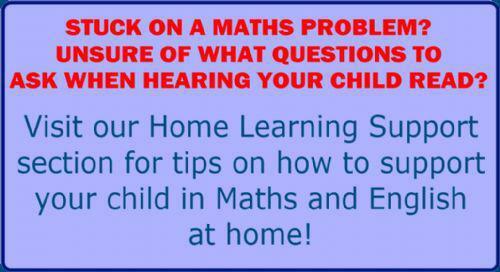 Could all Home Learning please be completed using a HB pencil (not pen or biro.) Whenever possible, we would like an adult to sign the Home Learning book and we would welcome any comments regarding how your child found the task.